If you’re hosting a Thanksgiving, Christmas, Hanukkah, New Year’s, or any other holiday party this year, we have the perfect way to make it memorable: with custom embroidered patches! Holiday parties are all about food, gifts, and spending time with friends a family, so why not make it a memorable event and create a patch to celebrate? If this year’s party is going to be a party to remember, why not give your guests something that will actually serve as a remembrance? Create a commemorative patch that your guests can wear or display and each time they see it, they can look back on the night and smile. Design a patch with your family name, the date of your party, a tagline, or any other element you want to highlight. Embroidered patches don’t always have to be commemorative. In fact, if you simply want to celebrate the holidays, you can create patches in festive shapes, characters, foods, and more to give your guests something fun to take with them. Create Christmas trees, turkeys, menorahs, snowmen, stockings, reindeer, pumpkins, or anything else that will remind you and your friends or family of the holidays. Once December rolls around, you’ll probably start thinking about holiday gifts and at American Patch, we can help you create a gift that’s both one-of-a-kind and meaningful. Embroidered patches are a great holiday gift because they can be customized to fit the personality of the person you’re giving them to. Create patches based on hobbies, interests, accomplishments, habits, humor, and more and make your friends’ or family’s holiday all the more memorable. To get started on your commemorative, festive, or gifted embroidered patches, take a look at our Custom Patches Guide or our Gallery for inspiration. 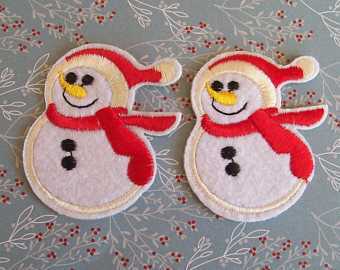 This entry was posted in Patch Ideas and tagged embroidered, holiday.